Saving leftovers for lunch the following day has become another way for me to save a little money and waste less food! Having a great set of food storage containers is essential for keeping leftovers fresh. SAVE TIME -- each container is microwave, dishwasher and freezer safe for long-lasting use. And lets face it, who can't use more food, money, space and time! I absolutely love my Ozeri Instavac Green Earth Food Storage Container Set! They definitely keep foods fresher, longer! I love the fact that they lids were so easy to lock and the vacuum seal was so simple, I've accidentally dropped them and the lids stayed one -- no messes! These food storage containers and durable and will be used over and over. I also love that they are stain-resistant so I can use them with all of our leftovers, including spaghetti and lasagna! Plus, they can go from the freezer to the microwave and then into the dishwasher. Making them functional and perfect for any family! 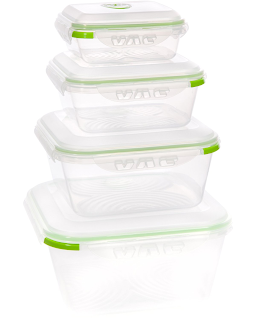 These BPA-free, stain-resistant, shatter-proof, Ozeri INSTAVAC Green Earth Food Storage Containers are as transparent as glass, and safe to use in microwaves, freezers and dishwashers. Each container features a handy date dial that allows you to record when food was first stored and monitor days kept in the refrigerator, so you'll never have to worry about remembering how long each container has been in the refrigerator. Each container is also made with a wave patterned bottom that keeps cut fruit and vegetables elevated from the deteriorating effects of water and juices which can collect at the bottom over time.